One can see how Szeliga is able to keep up with the life course of the unique if one compares, for example, the first paragraph on page 6 of his writing with pages 468-478 of The Unique [in “My Self-Enjoyment”]. Szeliga opposes the courage of thinking to Stirner’s “thoughtlessness” as if to a kind of cowardice. But why doesn’t he “enter into the innermost depths of the essence he is to fight”; why doesn’t he examine whether this thoughtlessness doesn’t get along quite well with the courage of thinking? He should have precisely “sat down as one with the object being observed.” But who could ever enjoy sitting down as one with an object as despicable as thoughtlessness. The mere need to name it makes one want to spit it out. 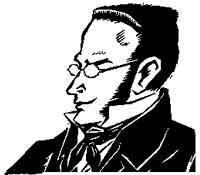 ^ However, outside of the title of Stirner’s book, I have chosen to translate the word “Eigentum” as “property.” The word can also translate as “possession” as in the phrase “to acquire possession of the book” or as “ownership.” It is useful to keep all these translations in mind when you read the word “property” in this text. ^ G. W. F. Hegel, Théodore F. Geraets (translator), Wallis Arthur Suchting (translator), Henry Silton Harris (translator) The Encyclopaedia Logic: Part I of the Encyclopaedia of Philosophical Sciences with the Zusätze (Indianapolis, 1991), in “Notes to Glossary,” p. 351. ^ This is the single instance where I have chosen to translate “Mensch” as man, in order to emphasize the distinction Stirner is making. He is emphasizing that what is actually “common” to every human being is that he or she is unique, as opposed to Feuerbach’s idealized concept of the “common man.” — translator. ^ Two socialist/left democratic publications of the time. Moses Hess published the first oF these.